Reserve your Valentine’s Day dinner at Crave for a chance to WIN! Crave is hosting a great Valentine’s Day event! 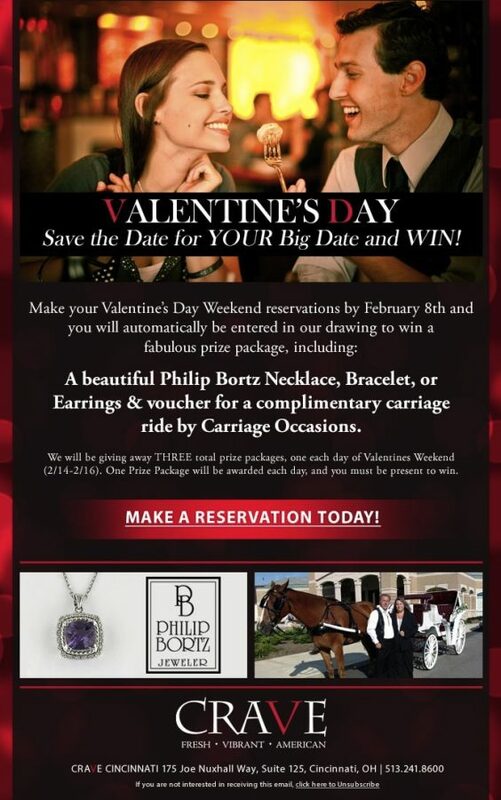 If you make a reservation for Valentine’s Day weekend before February 8, you’ll be entered to win a fabulous prize! Prizes include a Philip Bortz necklace, bracelet or earrings and a voucher for a complimentary carriage ride by Carriage Occasions! There will be three of these packages given away each day of Valentine’s Weekend, so you have three chances to win! Winners must be present to win so make sure you’re there! Crave is located at 175 Joe Nuxhall Way Suite 125. Call them at 513-241-8600 to make a reservation today! Posh Professional Mixer Dec. 11! So, make a resolution for better work-life balance in 2013. Join Cincy Chic for a fun event full of mingling and making new connections, complimentary swag bag, refreshments from Crave, a professional apparel fashion show by Macy’s at 6:30pm, and advice from Wellness Coach Debbie Pendl, who will offer tips and tricks to take you from burnout to balance in the new year. The best part? The event is FREE! More info is below – click here to RSVP!